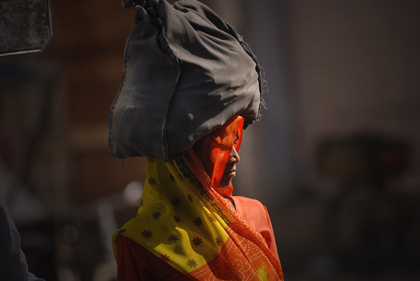 Kristian Bertel has compiled several hundred of his photographs from India. The archive stories are reflecting the travel photography by the photographer and the archive stories are all a subcategory of photography involving the documentation of an area in India's landscape, people of India, Indian cultures and history. For the photographer these photo stories all define a travel photo as an image that expresses the feeling of a time and place, portrays a land, its people or a culture in its natural state in India. Learn about the traditional headwear of many Indian women, the so-called Ghoonghat and what it means for the women in India to wear this variation the famous Indian sari. Read also about Udaipur, where the portrait was taken in this archive story. 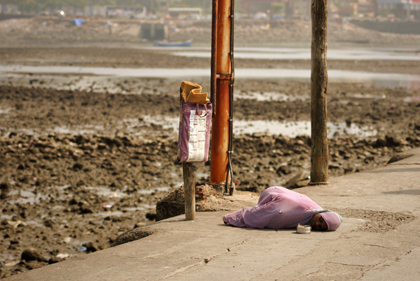 Read the archive story The photographer was visiting the 'Sick Street' of Mumbai located near the Haji Ali Dargah, when he pictured and portrayed this Indian girl clustered on the ground. 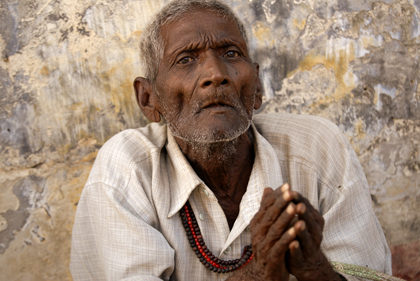 Read about begging and beggars in India in this archive story. The photographer was located at the Vidyapeeth Road in Varanasi in India, when he portrayed this Indian man in the holy Hindu city. Read about some of the highlights of Varanasi in Uttar Pradesh in this archive story. 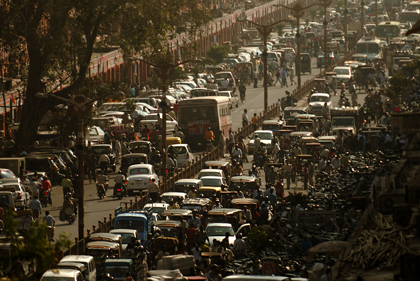 Read the archive story Chaos is the word that best describes Indian roads as seen at the Bapu Bazar in this photograph from Jaipur in India. 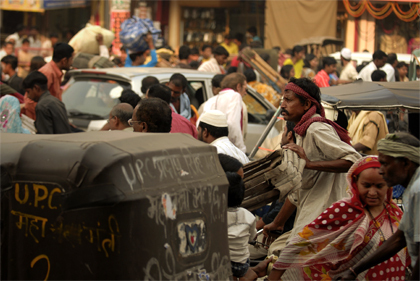 Read about this hectic market and souvenir street and the congested traffic in India in this archive story. 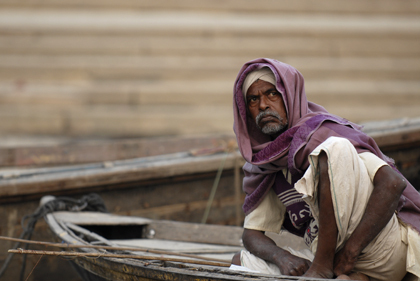 Water tourism is the second most important industry in Varanasi, the spiritual capital of India, where this fisherman portrait was taken by the photographer. Read about the fishermen of India and the Indian fish industry in this archive story. Read the archive story Sunrise or sun up is the instant at which the upper edge of the sun appears over the horizon in the morning as seen in this photograph from Varanasi in India. 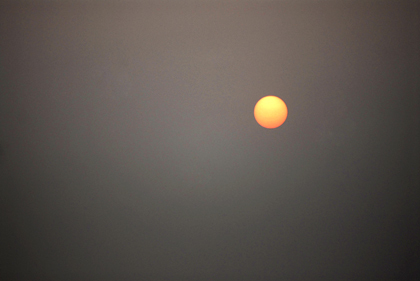 Read about the Ganges and the meaning of the sun in India in this archive story. India has one of the busiest railway networks in the world that yearly transports 8.1 billion passengers. In this archive story you can read about the Indian railway and the Varanasi Junction in Uttar Pradesh, where this portrait was taken. 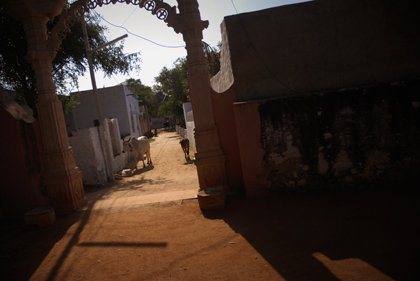 Read the archive story In Hinduism cows are thought to be sacred or deeply respected. In this archive story you can read about the beliefs of its butter 'Ghee' and strength and the role of the cows in India as the photographer stayed in Pushkar. In this archive story the photographer takes a look at the landscapes in India, which many places are barren and fruitless and where some spots are favored with lavish greenery with shocking woodland as in Ranakpur in India. 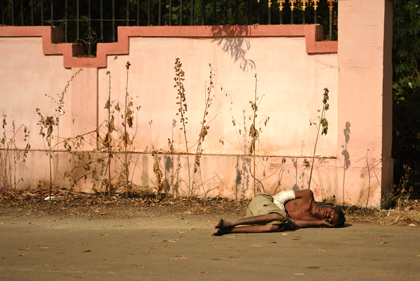 Read the archive story India happens to be a rich country inhabited by very poor people. Unfortunately, since departure of the colonial British all economic development has taken place in the cities, while the majority of the population lives in the countryside. In this archive story you will get a closer look at the bathing ghats in Pushkar. 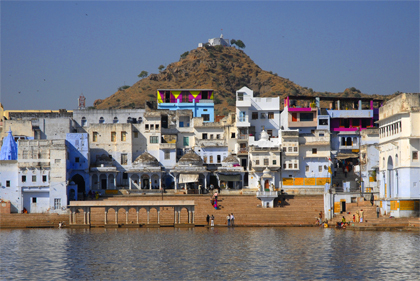 This holy city is located in the state of Rajasthan in India on the likewise holy Pushkar Lake in the Aravalli mountains and in the foreland of the Thar Desert. Read the archive story Pushkar ka Mela is an annual five-day camel and livestock fair held in the town of Pushkar in the state of Rajasthan, India. It is one of the world's largest camel fairs, where thousands of people go to the banks of the Pushkar Lake. 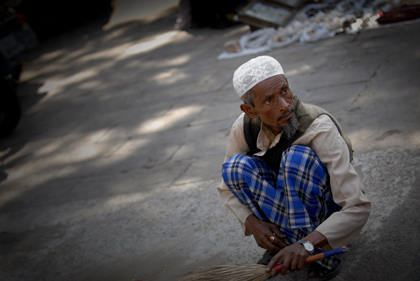 Kristian Bertel took the picture of this Indian man sweeping the pavement in one of the main streets of Jaipur in India. 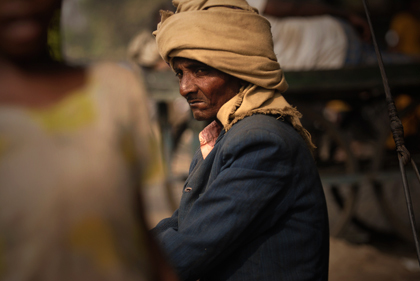 Read the archive story about the sweeping man in the capital of India's Rajasthan province. Read the archive story From the mighty Mehrangarh Fort, the blue city of Jodhpur, stands as a visual marvel in Rajasthan's arid desert. In the wind, one can hear the several eloquent pleas and prayers from the city's many mosques. 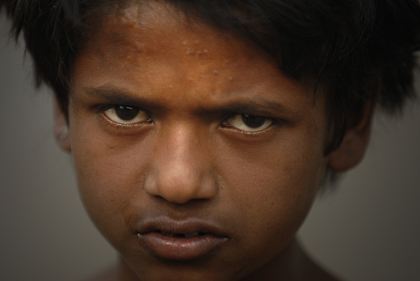 Read the story behind the photo of a beggar boy in New Delhi. The begging boy was photographed at Rajiv Chowk, Connaught Place, with a look that may show the downside face of India's growing economy. 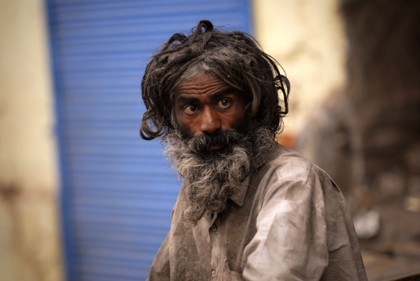 Read the archive story In the rough streets of Delhi the chaos rules. In the neighborhood and the alleyways of Pahari Dhiraj, it is puzzling with daily and rushing activities. Read about the photographer's street photography in this area. In Varanasi, the travel photographer visited the Godowlia Chowk, a place in the city, which always seemed to be busy with people. 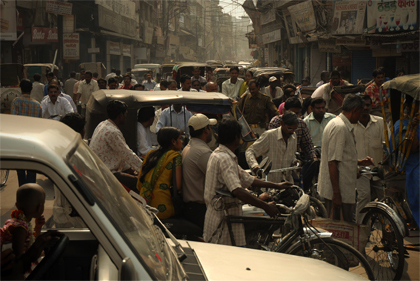 Read the archive story about this congested area of Varanasi, India in the province of Uttar Pradesh. 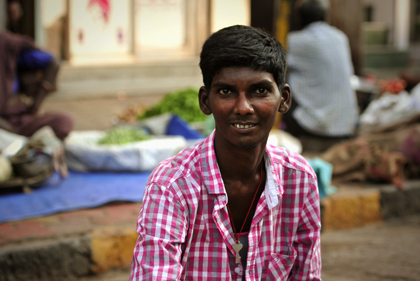 Read the archive story Street children in the classical sense are found in India almost without exception in the cities with a population of approximately 50,000 inhabitants. 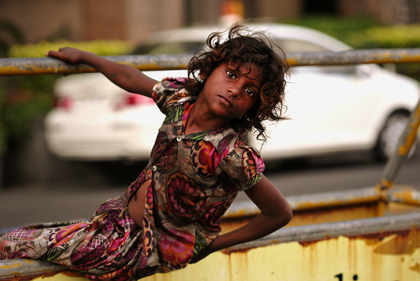 At the PJ Ramchandani Marg in Mumbai this street child was photographed. Villages in India are consisting of 640,000 communities that are strongly shaped by the caste system, where this boy portrait was taken by the photographer. Read about the villages in India in this archive story. 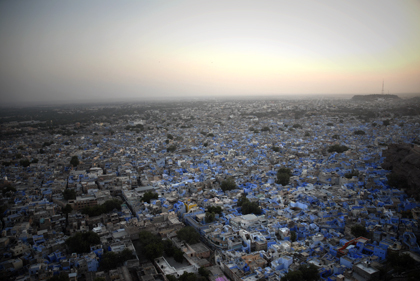 Read the archive story It is not without reason that Jodhpur in Rajasthan, India is called the 'Sun city' because the weather remains bright and sunny all around the year. 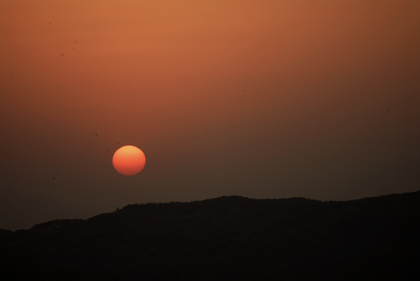 Read about the sun and it's ritual symbolism in India in this archive story. 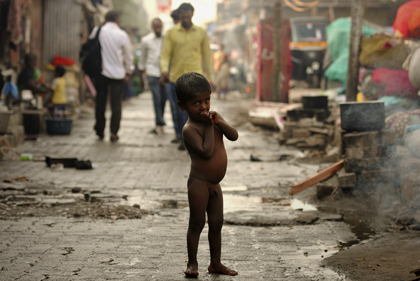 Poverty is one of the conditions of life in India. This wrinkled man was submissively trying to beg a few rupees from the neverending passing people in Uttar Pradesh's Sarnath near Varanasi. Read about the man in this story. 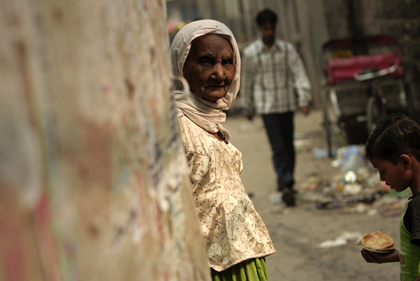 Read the archive story Picture portrayed in Delhi of a woman passing by at Sadar Bazaar. A place in Delhi, where the whirring street of Maharaja Aggrasen Marg cross-bounds with the railway at Sadar Bazaar. 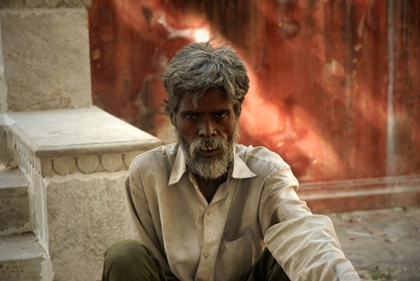 Read about Delhi and this intimate portrait. 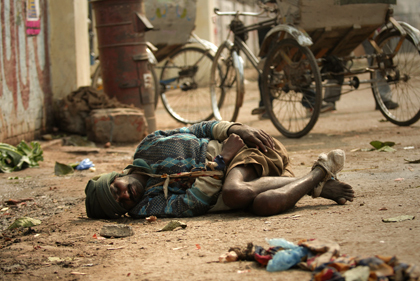 A man taking a nap in the streets of Delhi. With working hours up to 18 hours a day, a nap is well needed. 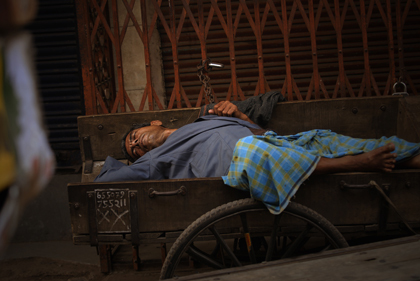 Read about the sleeping man on this hand-pulled cart and the working conditions in India in this archive story. Read the archive story Indian fashion varies from one village to another village, from one city to another city. India's fashion heritage is rich in tradition, vibrant in colors and prepossessing. 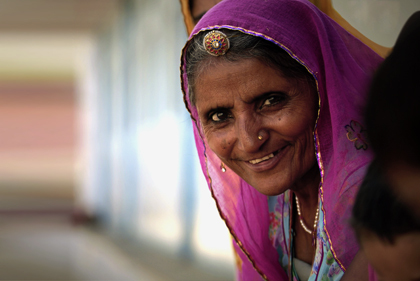 Read about this woman in Rajasthan's Pushkar in this archive story. Transportation of things is often carried on top of the head. To the foreign traveler, one of the powerful attractions in India is the colorful and diversified attire of its people. Read about the traditions of the rural life in India in this archive story. Read the archive story Photo of a Sikh priest in the Sis Ganj Gurdwara temple in Delhi. He is accompanied by musicians during the holy ceremony. 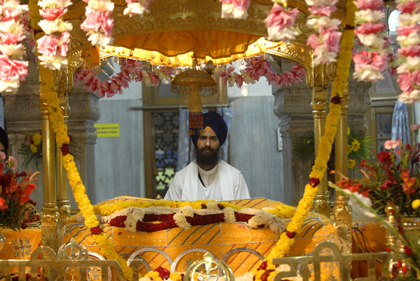 Read about the photographers colorful visit to the temple and learn more Sikhism in this archive story. 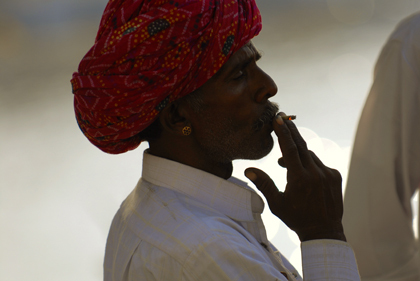 In the magical Hindu pilgrimage town of Pushkar in Rajasthan, India, the photographer met a Rajasthani man smoking a cigarette. Learn more about this cozy, relaxing and atmospheric Indian town in this archive story. Read the archive story Rana Mahal Ghat, a ghat in the holy city of Varanasi in Uttar Pradesh, India was photographed by the photographer. 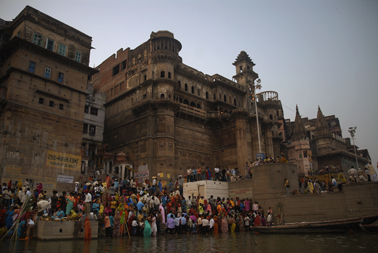 Learn more about this ghat and the many ghats in general of Varanasi in this archive story. Slums of India and the areas of slum and shanty towns in India have been of great interest for the photographer through the years. 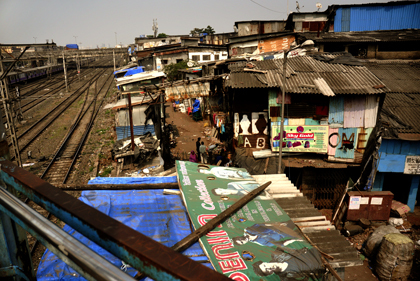 Read about some of the slum areas in Mumbai in this archive story. Read the archive story Standing majestically on the banks of River Yamuna, the Taj Mahal is synonymous to love and romance. Read about the photographer's encounter with the famous Taj Mahal in Uttar Pradesh, India in this archive story. 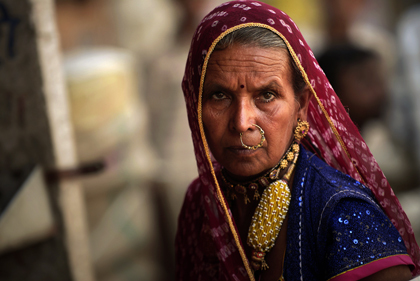 This picture of an Indian Gypsy woman portrayed in the town of Pushkar in Rajasthan, India is telling the story about the many Gypsy tribes in India. Read about the history of these Gypsy tribes in India in this archive story. Read the archive story Jaisalmer located in a land of rough and tumble of the Thar Desert in the Western part of Rajasthan, was once a historic great place for the camel-train routes between India and Central Asia. 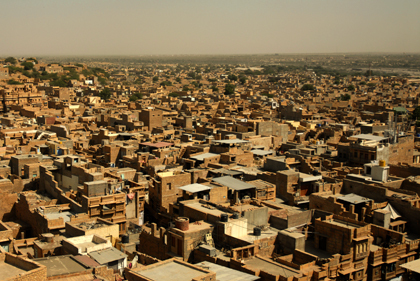 Read about Jaisalmer in this archive story. Portraying the life conditions of children in Mumbai and in India can sometimes be tough to see because of the lack of things in their childhood. 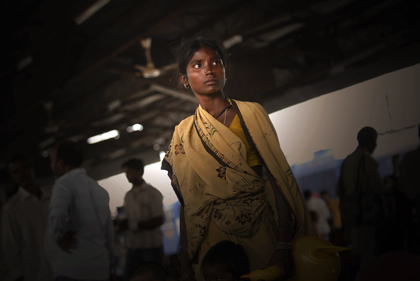 Read about children living in poverty in India in this archive story. Read the archive story Firsthand meeting with the rural poverty in India experienced in Dongri, Maharashtra, India by the photographer during a roadtrip in the countryside. 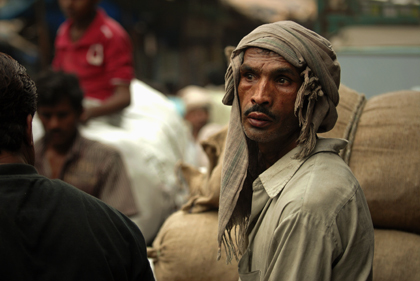 Read about rural poverty in India in this archive story. A Hindu temple is a spiritual destination for many Hindus, as well as landmarks around which ancient arts, community celebrations. 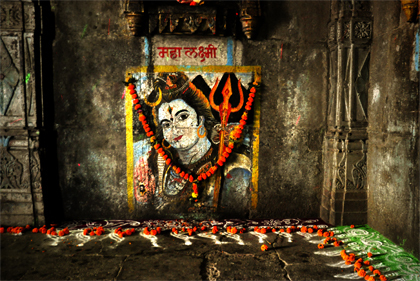 Read about the Sundar Narayan Mandir in Nashik, India in this archive story. 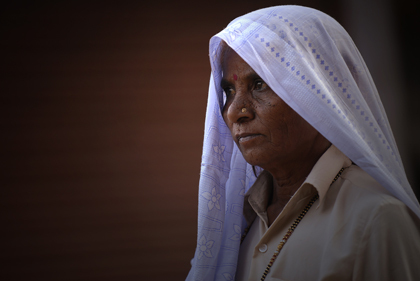 Read the archive story A bejewelled Indian woman in Rajasthan makes the picture in this archive story about the cultural aspects in India and the journeys that can be made in this incredible country. Read about itineraries in India in this archive story. 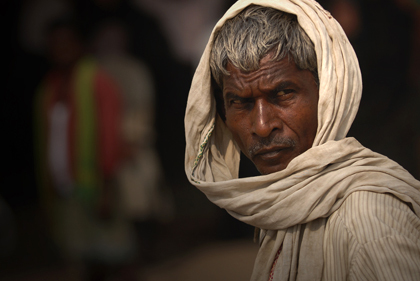 Portraits and portraiture of people has always been of great interest for the photographer during his journeys in India. Read about a portrait captured of an Indian woman near the City Palace Rd in Udaipur, India in this archive story. Read the archive story Traveling into the intricate alleyways of Udaipur the photographer visited the Jagdish Temple, one of the biggest temples in the city. 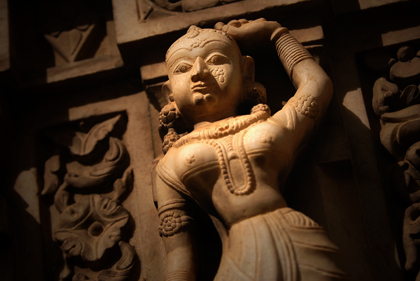 Read about the Jagdish Temple and stone carved figures in this archive story. 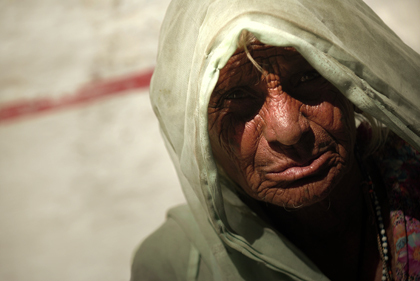 An intimate portrait in India was taken at the Chawri Bazar Rd in Old Delhi in India, a moment of peace on camera with this portraiture of an elderly Indian man. Read about portrait photography in India in this archive story. 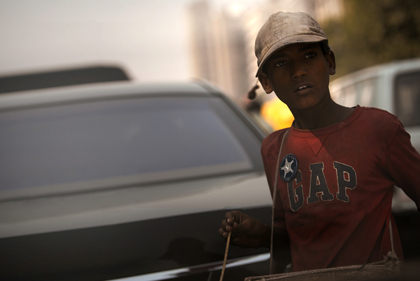 Read the archive story Venturing into the streets of Delhi with a camera on his side the photographer took this picture of an Indian street child walking from car to car selling things. 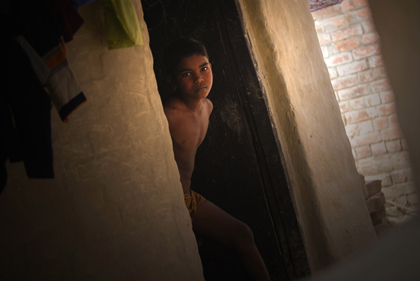 Read about the life conditions of the street children in Delhi in this archive story. As a photographer and traveler in India it is hard to ignore the waste that is filling the streets. In Badi Chaupar not far away from a famous building in Jaipur, India's waste problems are visible. 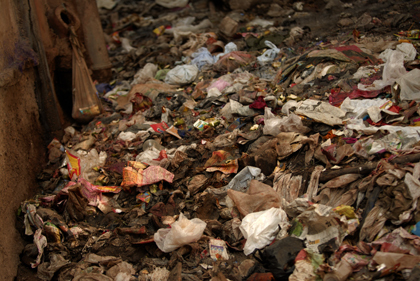 Read about waste in India in this archive story. Read the archive story As you step out of the New Delhi Railway Station and cross the road, you stand at the entrance of Paharganj Main Bazaar. 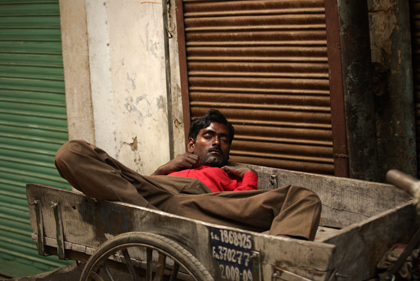 Read about the use of hand-pulled carts in Paharganj, Delhi in this archive story. Getting around Delhi is always an adventure. Traffic is, by and large, horribly congested and many drivers will think nothing of quoting ten times the going price to a tourist. Read about a photowalk on Naya Bazar Rd in this archive story. 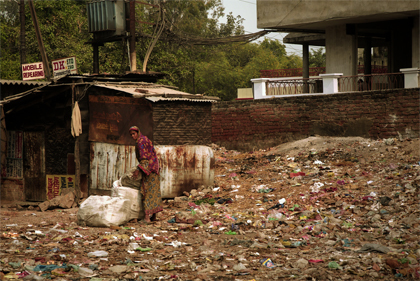 Read the archive story Yamuna is not just a natural resource and it continues to be polluted with garbage while most sewage treatment facilities are underfunded or malfunctioning. 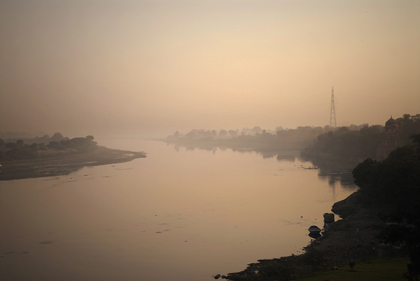 Read about one of the holiest and most polluted rivers in India in this archive story. Walking around as a traveling photographer in the pilgrimage town of Pushkar you can really feel that this a Hindu town. Read about the place, where the epics say, that Brahma dropped a lotus flower on the earth in this archive story. Read the archive story Desert safaris on camels have become increasingly popular around Jaisalmer. 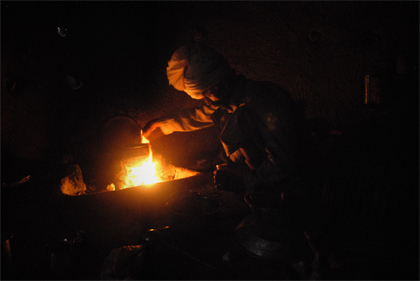 Read about the photographer's visit with a Rajasthani family in the Thar Desert in India, where he stayed the night in this archive story. Giving money to child beggars is the least generous thing a tourist can do. Because when we give money directly to child beggars, we actually hurt more than we help. 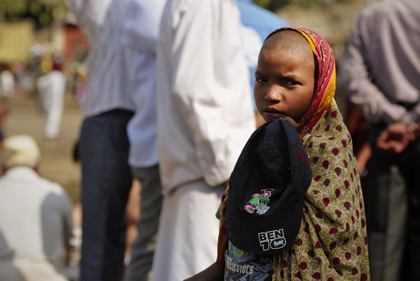 Read about an Indian beggar girl in Ram Nagar, Delhi in this archive story. Read the archive story India is the second most populous country in the world with over 1.2 billion people. Read about the photographer's people portrait from Varanasi in India and learn more about the Indian population in this archive story. 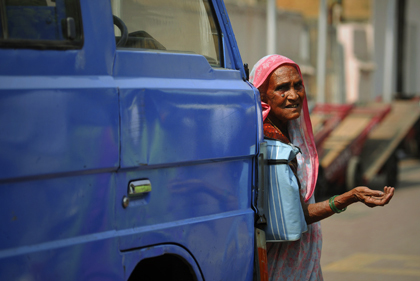 India has demonstrated that aged people in India have crossed over 100 million. 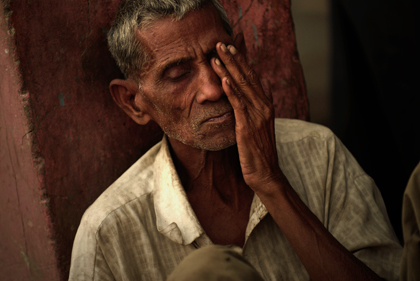 Many older people in India are not alert about the human rights of this group. 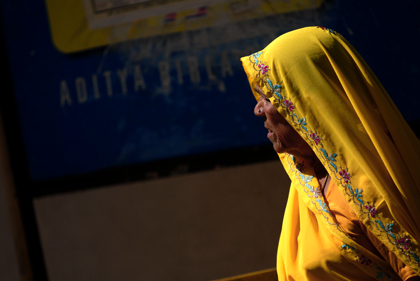 Read about elderly people in India and the Aram Nagar area in this archive story. Read the archive story Taking a rickshaw ride through these streets of Chandni Chowk in Delhi, India is absolutely crazy. There are so many rickshaws, bikes, people and the streets are filled with every possible market. Read about the area in this archive story. 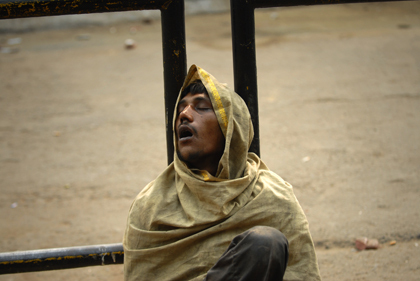 At the circle in Delhi the photographer caught this photo of a sleepy-eyed Indian man resting up against a steel fence at Connaught Place also known as Rajiv Chowk. Read about the the place between the rich and the poor in this archive story. Read the archive story Junagarh Fort is one of the few major forts in Rajasthan which is not built on a hilltop and it was originally called Chintamani and was renamed Junagarh. 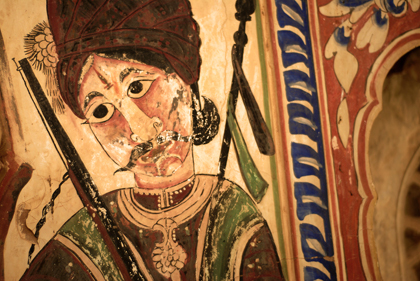 Read about the fort in the city of Bikaner, India in this archive story. As a photographer and traveler in India it is easy to feel the historic past in Rajasthan, where the Maharajas meaning the great kings ruled the princely states in India. Read about the Maharajas in this archive story. Read the archive story In Hinduism, the cow is a symbol of wealth, strength, abundance, selfless giving and a full Earthly life. In the religion of Hinduism, the cow is thought to be sacred. 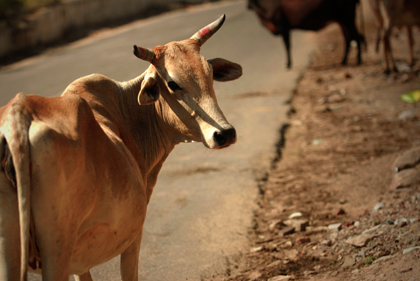 Read about the holy cows of India in this archive story. Bangles are rigid bracelets usually from metal, wood or plastic. They are traditional ornaments worn mostly by South Asian women that can be seen as a traveler in India. 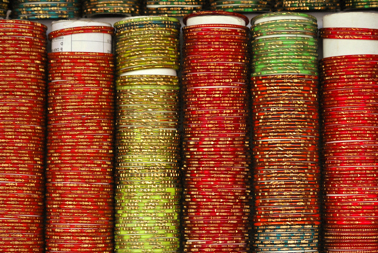 Read about bangles and jewellery of India in this archive story. Read the archive story Take a step back from the hustle in Udaipur, a city that still has its colorful magic, not just in its marvellous palaces and monuments but also in colorful sarees. Read about the colors of India in this archive story. In the Indian society, people who work in ignominious, polluting and unclean occupations are seen as polluting people and are therefore considered as untouchables. 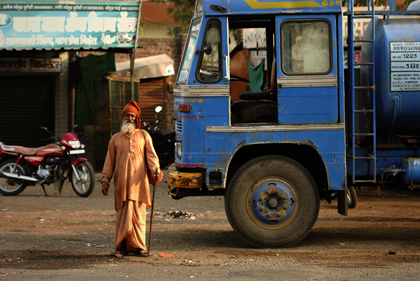 Read about India's caste system in this archive story. 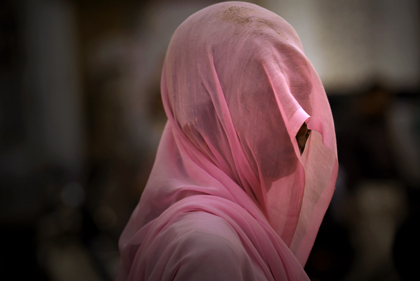 Read the archive story In this portrait taken by the photographer at the Qutab Rd in Delhi an Indian woman is seen with the skin disease vitiligo. Read about the portrait and the chronic disorder that causes pigmentation of pathes of the skin in this archive story. 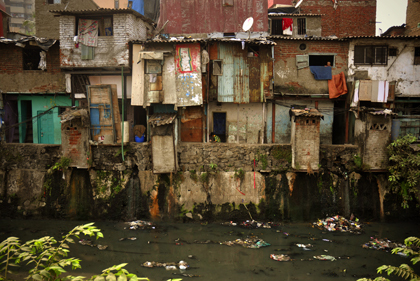 A heavily populated urban area characterized by substandard housing and squalor and the slum areas are characterized by substandard housing structures. Read about shanty homes which are often built in this archive story. Read the archive story The photographer is a believer in that virtually any lens can take a good portrait shot if you work to its strengths. Having said that, some lenses do tend to lend themselves to great portraits. Read about the portrait in this archive story. 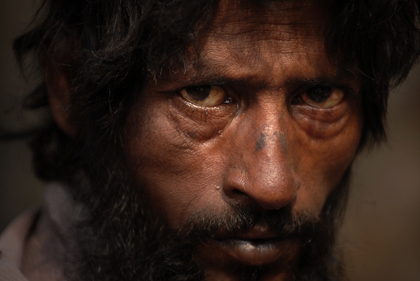 The photographer went to the Gatore Ki Chhatriyan in Jaipur, where he took this portrait and portraiture. Read more about this peaceful and soothing place in India and how he is photographing in this archive story. 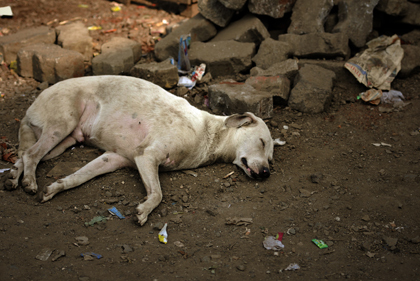 Read the archive story In this story we learn about the dogs in the streets. They live virtually wherever cities exist and the local human population allows, especially in the developing world such as India. Read more about these roaming dogs in this archive story. In India you will sooner or later be confronted with begging people and children. Everyone and everyone has to find their own way of dealing with it and it is a difficult topic. 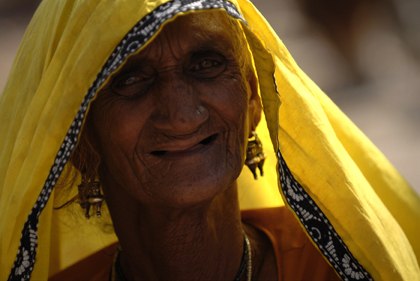 Read more about an Indian beggar woman in this archive story. Read the archive story It is one of oldest properties of Mumbai suburban and this hotel built in the Colaba region of Mumbai in Maharashtra, India is situated next to the Gateway of India. 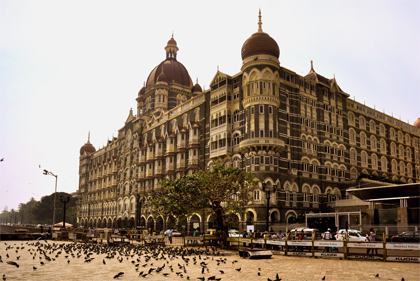 Read more about the Taj Mahal Palace Hotel in this archive story. 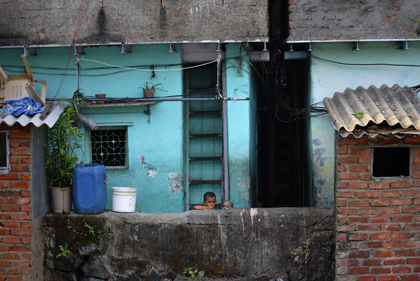 In this archive story we will focus on slum children in the Dharavi area of Mumbai. These slum children often came from the country to one of the great cities with their families and live in slums or in the outskirts of the cities. Read the archive story Leprosy is one of the least infectious diseases as nearly everyone has some measure of natural resistance against it. 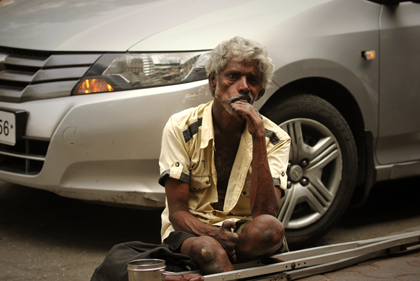 Nevertheless, it continues to spread in India as seen with this leper man in Mumbai. Read more about the diseas in this archive story. The youngster portrait was taken at the Carnac Rd just near the Mahatma Jyotiba Phule Mandai, formerly Crawford Market in Mumbai, which is one of South Mumbai's most famous markets. Read about portrait photography in this archive story. Read the archive story As cities grew, so did the slums, welcoming more rural migrants and creating more urban poverty in India. Read about the Mahim area in Mumbai, where there is not housing for everyone in this archive story. 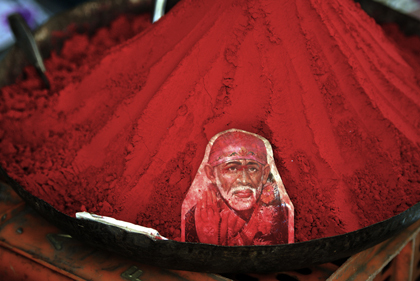 Driving between locations in the Maharashtra state the photographer met a Baba near a road wearing saffron-colored clothing in a small market town of Maharashtra. 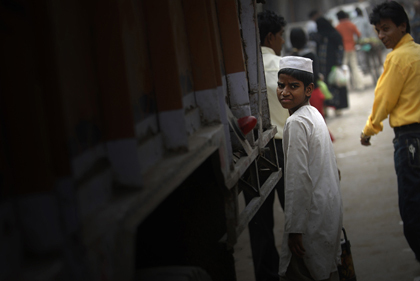 Read about Maharashtra in this archive story. Read the archive story For the photographer stations have been some of the places, where he can photograph the true life in India. 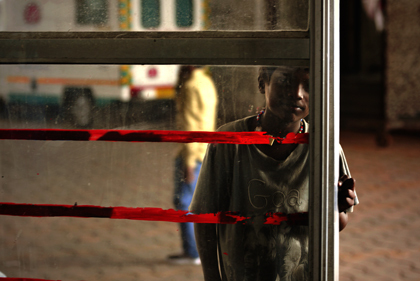 Through a glass window he photographed this Indian boy. Read about portraits in this archive story. With different climates in different parts of the country, India produces a variety of spices, many of which are native to the subcontinent and have since been cultivated locally for centuries. Read about spices in this archive story. Read the archive story In Uttar Pradesh the photographer portrayed this Indian woman taking care of the household in her village home. 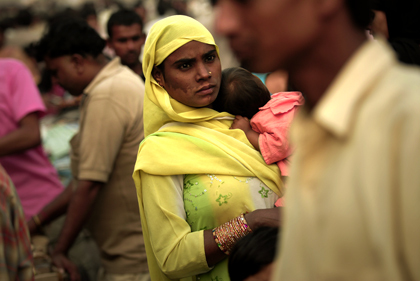 Read about womens role in India and the country's villages in this archive story. Almost everyone suffers a cultural shock in India. Because of the "differentness" of the country is not surprising. But whoever is serious about understanding and at least knows some of the most important differences, will discover the beauty of India. 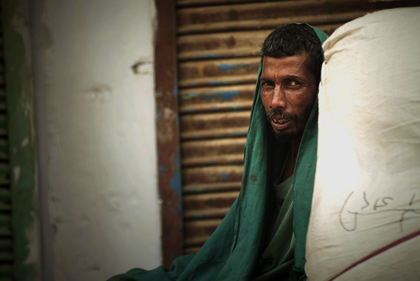 Read the archive story In Delhi it stinks and the air seems to be standing as the photographer took this photograph of an Indian man covering himself in a traditional scarf at the Azad Market Rd. Read about the Indian hygiene, which is a task for any traveler in this archive story. When visiting India you can see many striking photos in the streets and in countryside. Stories that ranges from the city of Delhi to the streets of Varanasi to the urban landscape of Jodhpur. The stories you see on this page of the photographer's website has been taken of a wide variety of subjects under varied available conditions, including low light photography, available ambient light photography for dark streets and evening photos and photo shootings on the streets where sometimes conditions may be difficult, capturing moments which rarely recur, capturing the magic of light while shooting landscapes. The photos might spark a range of emotions, from sorrow to joy and hope for the viewer. But we often never learn the full story behind a photo, all the factors at work that put the photographer in the middle of the moment to get the picture. In the archive section you can find a number of travel photographs, stories from Mumbai that tell the travel stories of how he photographed the scenery in India. The photographer's images have a story behind them, images that all are taken from around India throughout his photo journeys. The archive photographs delves into Kristian's personal archive to reveal never-before-seen, including portraits and landscapes beautifully produced snapshots from various travel assignments. The archive is so-far organized into 74 photo stories, each brought to life by narrative text and full-color photos. Together, these fascinating stories tell a story about the life in India. India, the motherland to many people around the world, a land of unforgetable travel moments. The archive takes viewers on a spectacular visual journey through some of the most stunning photographs to be found in the photographer's archive collection. The photographer culled the images to reflect the many variations on the universal theme of beauty and everyday life in India. By adding these stories the photographer's work might immensely enhanced the understanding of the photographs. Stories in indigenous cultures like those in India encompass a variety of values. These values include an emphasis on individual responsibility, concern for the environment and communal welfare. Stories by the photographer are based on values passed down by generations to shape the foundation of the community. Storytelling is used as a bridge for knowledge and understanding allowing the values of oneself and community to connect and be learned as a whole. Storytelling from India for instance allows tourists and travelers about the community values to be learned at different times and places for different regions such as Rajasthan and Uttar Pradesh. Stories are told from the perspective of the people photographed in the storeis above about their lives. In this way, people learn to value their place in the world as a person in relation to others. Typically, stories are used as an informal learning to people who are interested in India. In this way, stories are non-confrontational, which allows the curious traveler to discover for themselves what they might be interested in or can expect while traveling in India and what they can do to adjust their journey. These aspects of digital storytelling, pictures, music and narration reinforce ideas and appeal to different learning types. Guides can use it to introduce projects, themes or any India content area and can also let their students make their own digital stories and then share them. As a photographer he creates digital stories to help facilitate discussions, as an anticipatory set for a new topic, or to help people gain a better understanding of more abstract concepts of India. These stories can become an integral part of any presentation in many subject areas such as poverty, destinations and portraitures. Those who listen to the stories of people traveling in India rarely feel the need to visit the country immediately. This is a pity, because India is not only waiting with unforgettable experiences, but also with beautiful corners. India is one of my favorite countries. The photographer has visited the subcontinent twice and have been baked for about two months through the country. Problem could be imagined, synonymous nor a third time to go. On the other hand, he finds it somewhat harder to put the enthusiasm for the country into words. When he talks with people who were already in India, they mostly talk about how they were shaken in the buses or how an innocent looking boy sold them a bottle of mineral water, on closer inspection showed that they were using ordinary tap water is filled. These are not particularly tempting memories. India travels are exhausting and nervous. But away from the chaotic and dirty big cities, the country offers numerous pearls. A beautiful potpouri with great sights has been created all over the country. The photographer's favorite place is probably what the most popular among India would imagine and only the few as nice or even favorite place titled, colorful, loud, crowded, quirrlig and dirty, the old town of Delhi. Nothing has impressed him so much as the crowded streets of Old Delhi, where hundreds of people are crowded, sacred cows in narrow alleyways looking for food, small street stalls advertise their goods, and tuk-tuk drivers try to get a way through the crowds pull. It is best to carry only light luggage with you, because it becomes tight. Sit down on a street corner, enjoy the best chai you have ever drunk, maybe you will find the dealer who bakes small biscuits on hot carts in a cast-iron pan, tasting delicious, can be a whole lunch, see Indians at haggling for colorful arm-rings, and spend the afternoon with a sari merchant to marvel at, haggle, and drink tea. 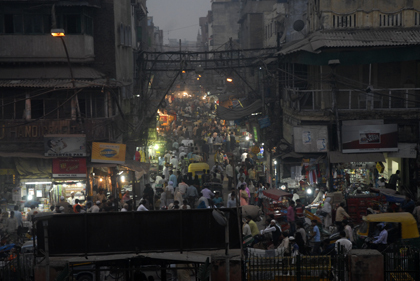 Buy curry at the huge spice market and rest in the quiet courtyard of Fatehpuri Masjid. This is Old Delhi and for him is the most beautiful place in India. Incredibly beautiful buildings like the Taj Mahal in Agra, women in colorful saris, colorful color clouds at the Holi Festival or the kitschy Bollywood. These are all things that make Incredible India and we want to discover as a traveler there. But to be able to really see the beauty of India and not be taken by the chaos, you should take good care of the country before traveling to India. In no other country can you experience such incredible stories and fascinating scenes. Sometimes you land in the midst of a jubilant wedding company. Once in the open street the color powder is cut around the ears. Sometimes a director spontaneously hires you as an extractor for his latest Bollywood strip in the streets of Mumbai and traveling in India has many faces, but also shadows. Photographing begging children, traffic accidents, bagpipes or the unimaginable smog bells over the Indian cities is something that awakes you as a photographer. But this immense attention and the flash of lightning can be very stressful, especially if you just wanted to drink a Lassi in peace and the ways to deal with attention and photography depends on everyone. Personally, he experienced that one is most likely to be at peace again, if one bows to his fate, smiles pleasantly and lets himself be photographed for the Indian family album. But also vehement ignorance is a way to react to the distress. What is strange is usually only friendly gestures and a sign of hospitality. From busses without brakes, cows on the highway, unlit rolling fields at airports, and indifference towards tourists to the 'Indian flexible time', which India travelers have to face. The Indian everyday life is full of improvisations, so that it does not necessarily have to be due to the lack of will of the people if they arrive much later than planned. Indian time is relative and punctuality in itself may not have a high priority and on the other hand, it is also hard to demand. This kind of oriental patience is particularly frustrating for the Western European visitor, when they are experienced live. For instance, if the intercity bus collapses in the middle of the night and you have to wait for a replacement for hours. While travelers easily lose their nerves in such situations, Indians are always left alone. Unimaginable misery and poverty are just as ubiquitous in India as progress, culture, temple fortunes and the joy of life. Between idyll and life, enjoyment and diarrhea, are often only seconds. But what is already time in a country with more than 1.2 billion inhabitants as the second most populous state in the world. For many India riders the transfer from the airport to the hotel is becoming a torture. At the red traffic lights, begging figures push themselves to the window, knock children in rags on their sides in Mumbai, and lepers lift the shirt to show their suffering. At the railway barrier during the overland trip quickly get off the bus and represent the legs  this is only hard-boiled to recommend. In the chorus of the "One Rupee, please!" calls also the most generous tourist still like a miser. Sure, there are worlds between the relatively prosperous Kerala in the south of the country and the poverty-stricken villages of Uttar Pradesh. But wherever people live from hand to mouth, the tourist becomes the potential changing care package. For good reason and despite the annual economic growth of more than five per cent, about thirty percent of all Indians earn less than one dollar per day  and more than thirtfive percent are illiterate. India's middle class which currently is around 300 million people may grow and thrive, as obvious as the ubiquitous poverty is not it! In the big cities, slums and villas are often close to each other. India has a lot of impressions, fascination, amazement and complete breathlessness whether due to smog or other things is the short and banal summary of a journey through India. How can one summarize such a large country, in which new surprises await on every corner, in one archive story. And for this reason come here the archive stories above with stories that the photographer encountered in India. For a long time, however, this does not mean that this is all. India is great. India is filthy. India is usually not beautiful. Still, you have to get to know India, you have to smell it and taste it, until it is clear what is really in this huge land. Spending time with the locals is the most important thing for the photographer when traveling. He thought that this would be difficult in India, but he still knew the right Indians in the right place and could really learn a lot from them. To sit with the rickshaw driver in the rickshaw and listen to the sweet coke and a beedie, the Indian cigarette, from the romances of a lonely Indian is the very best thing that happened to him on his trips to India. He has learned that it is really important to take a step towards the people from time to time and make them feel fully respected and tolerated. For only then open-minded people, like the Indians, are opening up. From the stories of people. Besides, he learned how to shake his head properly, Indian style. This is easy, just wiggle, a mix of wiggling and nodding and you already have three answers in one  Yes, No, Maybe. As simple as that. And actually a small wiggling head shaking or nodding opposite the taxi or rickshaw driver also conjures him a smile on his face. A city has joined his favorite cities Udaipur in the north of India in Rajasthan. It is said to be the most romantic city in the world and is also written about in more archive stories. After the photographer was in Delhi he could not imagine the combination of romance, city and India, but Udaipur taught him a better one. The city was built around a lake and its roads crossed, uphill and downhill. Right and left, small, sweet shops wait for the conquest of the tourists and high up on top of most restaurants waiting for a cool Kingfisher beer with incredible views over Udaipur and its flickering lights. Many hotels in Udaipur are still real Havelis, which are buildings built and furnished like palaces. Stories are also a ubiquitous component of human communication from Rajasthan to Uttar Pradesh and any other place in Indoa. Human beings often claim to understand events when they manage to formulate a coherent story or narrative explaining how they believe the event was generated. Narratives with stories thus lie at foundations of our cognitive procedures and also provide an explanatory framework for the social sciences, particularly when stories from India have to be told. As the photographer a story is often used in a photo story in a research in the social norms of India. Here it has been found that the dense and interpenetrating nature of social forces uncovered by detailed narratives from India is often more interesting and useful for both social theory and social policy than other forms of social inquiry. A writer as the photographer may choose to tell the story from different points of view from the Indian's side with aspects from the streets. Then it is up to the reader to decide which narrator seems most reliable for each part of the story. In Indian communities. storytelling are often told by a number of elders in the community and in this way, the stories are never static because they are shaped by the relationship between the writer and audience. Thus, each individual story may have countless variations. Narrators often incorporate minor changes in the story in order to tailor the story to different audiences. With empathy and respect for Indians it is an important aspect in storytelling rights because if the audience has empathy towards a story, there will be less of a chance for India ethics. Empathy presumes the ability to understand another's India life story as its opposite, the inability to empathize, is reserved for situations that the normal person cannot imagine. Empathy describes the sphere of the normal and allows us to imagine what any normal person would do. In other words, the reader of a story will not be able to comprehend a story without empathy. That is why empathy is an important component concerning storytelling rights. The stories of India show how stories are worth telling and highlights an important issue regarding the ethics and storytelling rights in writing. Logically, when the writers stories are not being adequately represented, the ethics of storytelling rights are not honored. Oral traditions of telling stories are found in several civilisations besides India and they predate the printed and online press. Storytelling was used to explain natural phenomena, bards told stories of creation and developed a pantheon of gods and myths. Oral stories passed from one generation to another generation, village to village and storytellers were regarded as healers, leader, spiritual guides, teachers, cutural secret keeper and entertainers. Human knowledge is based on stories and the human brain consists of cognitive machinery necessary to understand, remember and tell stories from the states of India. Humans are storytelling organisms that both individually and socially, lead storied lives. Stories mirror human thought as humans think in narrative structures and most often remember facts in story form. Stories from India in this archive is based on the photographer's own insight of traveling in the country. Often a person needs to attempt to tell the story of that experience before realizing its value. In this case, it is not only the listener who learns, but the teller who also becomes aware of his or her own unique experiences and background and this process of storytelling is empowering as the teller effectively conveys ideas and, with practice, is able to demonstrate the potential of human accomplishment. Stories from the streets of India taps into travel knowledge and creates bridges both culturally and motivationally toward a solution imagine new possibilities for topics in India. Stories are effective educational tools because listeners become engaged and therefore remember. Storytelling can be seen as a foundation for learning and teaching. While the storylistener is engaged, they are able to imagine new perspectives, inviting a transformative and empathetic experience. This involves allowing the individual to actively engage in the story as well as observe, listen and participate with minimal guidance. Reading stories from a photographer's travels can create lasting personal connections, promote innovative problem solving and foster a shared understanding regarding future ambitions. Together a story can seek best practices and invent new solutions. Because photographic stories and these archive stories by the photographer often have multiple layers of meanings the readers have to read closely to the knowledge in a story from Delhi. The stories are used as a tool by the photographer to teach people the importance of respect through the practice of understanding India as a a country. As well as connecting children with their environment, through the theme of the stories, and give them more autonomy by using repetitive statements, which improve their learning to learn competence. It is also used to teach children to have respect for all life, value inter-connectedness involving the readers through Indian stories. In Indians communities stories are a way to pass knowledge on from generation to generation. Furthermore the stories and storytelling is a way for people and their communities to learn about their culture and their identities. In the photographer's stories poverty and cultural aspects of India is written about and stories practice that they have had in the past and what changes they want to see in the future. They notice that storytelling makes an impact on the lives of the children of India too. According to the photographer's stories many street children live hard lives and the stories are one of many main practices that lets the world know about these street children the important principles to live a good life instead of roaming in the streets. India is a land of contrasts and offers a fascinating, exotic culture. Many travelers want to get to know as much as possible of this great country and therefore decide on going to India and the incomparable natural and mountain scenery inspires active and trekking holidaymakers. 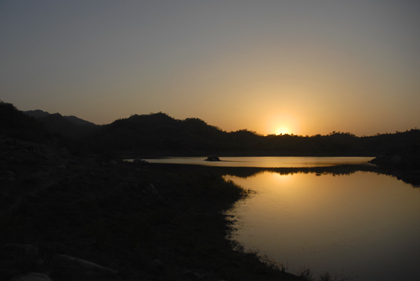 Away from the tourist centers you will find many unspoilt places where you can still experience the original India. Along the way, historic palaces and temples invite you to visit. In addition, during your holiday in India one should plan a visit to the capital New Delhi, whose colonial buildings and palaces contrast with the modernity of the city. 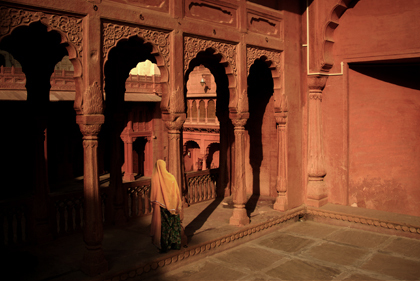 With the photographer's many pictures of India he takes one on a journey into another world that seduces all the senses. India presents itself colorfully and musically in the famous Bollywood films and so colorful and atmospheric the country expects you in reality. Be fascinated by the culture of the Indians and be carried away by the joie de vivre of the people in their colorful robes. Hike through the mountains in the Himalayas and take a trip into the jungle on the back of an elephant. 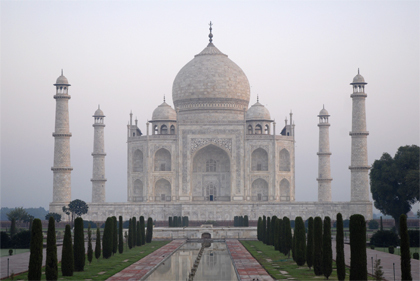 If you want to learn more about traveling to India, an insight into exotic Asia. Many begin their journey in the north of the country in Delhi, the bustling metropolis of India, and discover unique and highly detailed temples and palaces, as well as the city's colorful and vibrant markets. Also the Rajasthan region and its capital, Jaipur called the Pink City, are worthwhile destinations for one's India journey. A trip to the fairytale-like and famous tomb Taj Mahal, also located in the north of India, one should not miss and is recommended by the photographer. For shorter distances, it is recommended to take a taxi, as these are usually so cheap that you do not have to fall back on the crowded and often poorly equipped public transport. However, a bit more routes can also be done well with long-distance buses. For very long distances, however, the night trains and domestic flights provide the greatest comfort. TOne can also try a fresh Lassi, the typical yoghurt drink offered on many street corners. Other features and sights the photographer has the archive stories with insight stories from India.